When I first saw this book, it’s eye-catching cover made me instantly think that it was going to be similar to ‘Eye of The North’ or ‘The Polar Bear Explorers’ Club’ (both excellent adventure stories, by the way), but I was spectacularly proved wrong. You would think by now that I would know not to judge a book by its cover! I have mentioned before that I am a huge fan of Barrington Stoke, as it publishes what it calls ‘super readable’ stories covering such a broad range of topics. Race to the North is no exception. 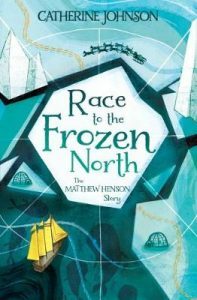 It’s the story of adventurer Matthew Henson, who it is claimed was the first (American) person to reach the North Pole in 1909, but who was forgotten and ignored for many years due to the colour of his skin. After doing a bit of research about the North Pole on the old tinterweb, it’s worth pointing out that while the American government finally announced in 1910 that Henson’s expedition (headed by Commander Peary) was the first true journey to the North Pole, there are now conflicting views as to whether or not the North Pole was reached due to lack of substantive proof. However, there is no doubt that at the time and for many years after, Henson was treated differently to his white expedition counterparts purely due to his skin colour. For me, Race to the North is both inspiring and informative, as it contains a number of important messages such as overcoming adversity, resilience, and striving for success, as well as introducing the concept of prejudice in an appropriate way for a younger audience. It is written in the first person, and Catherine Johnson’s engaging writing style makes you want to keep reading more. With all Barrington Stoke texts, the book has a dyslexia-friendly layout, typeface and paperstock so that even more readers can enjoy it; it has been edited to a reading age of 8, and has an interest range of 8-12. The story is perfect for sharing, as well as an individual read, and I also think it would make a great ‘free readers’ reading book for those who are not fans of extended reading (such as my daughter), as the chapters are mostly short, and even the longer chapters have plenty of natural breaks. If you want to get a better feel for Race to the Frozen North, Barrington Stoke have kindly allowed access to the first chapter of the book below.